Later in the story, they talk about how Charlie passed away. 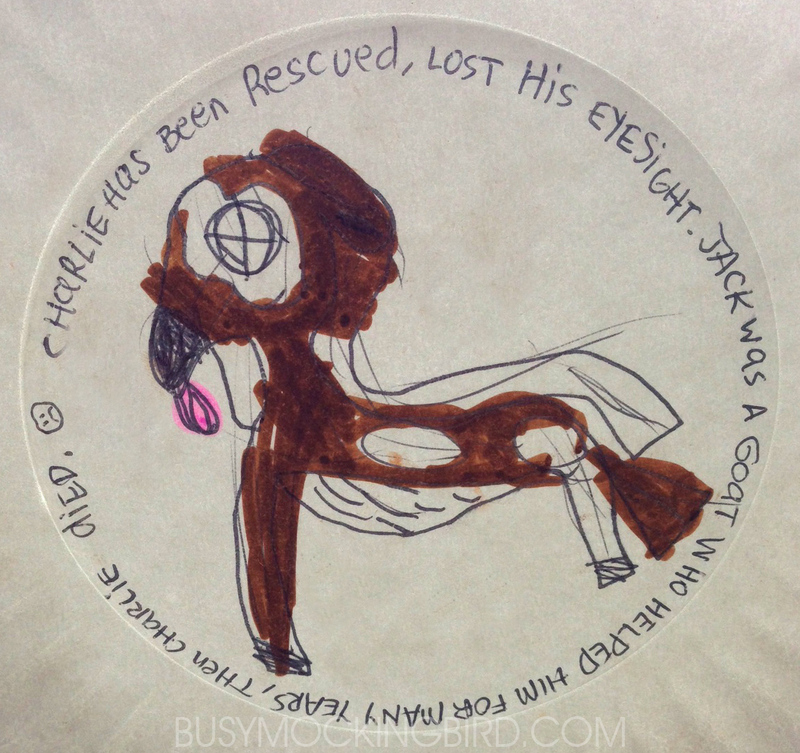 In tribute, Myla grabbed a paper plate and asked me if she could draw Charlie after he died (she has learned to ask about potentially inappropriate images after some “artistic mishaps” at school), and I said it would be okay. I don’t think she meant it in a morbid way; to her mind, it was more of a tribute. The “x” eyes and the tongue sticking out are merely a way of telling you visually that the sweet horse that was part of this amazing story died. She wanted people to know about Charlie and Jack. She asked me if I’d write the story around it, and I took dictation on the words she wanted me to write. She asked if we could get a big stick and put it in the front yard so that everyone could see the story, but (thankfully) I convinced her that the weather might be an issue, and we compromised by taping it to the window in our kitchen nook. So, we have a drawing of a dead horse on our window. But it’s sort of…sweet, actually? And that’s the story of Charlie and Jack, and how Myla loved them. What a sweet and beautiful tribute to Jack and Charlie. Made me cry. sorry, our comment were sent before we were done. The last sentence should read: Mylar is learning the same kind of compassion Jack had for Charlie and that our Jake has for both Jimmy and Louie. We have just viewed this wonderful story of compassion, both the compassion of an old goat for an old horse and also the compassion that little Myla shows for Charlie the horse when he dies. It reminds us of our next book for which Gayle is still working to complete the layout. In Jake, Little Jimmy and Big Louie” you will read about the compassion a boy has for a wingless budgie and later the love that develops between them and an “interloper” a raven who soon becomes a treasured member of the family. Computer and printer problems have delayed her progress as well as another big editing commitment which is now completed. Watch for our announcement of publication – we hope SOON!!! I just love you two!! (and your blog) You two are so sweet and compassionate (and quirky and fun, too) You sure are gifted in your ability to interact with and guide your daughter. What a big heart your child has, thanks to you. I saw the story when it aired. Too bad more people don’t show that kind of compassion. It’s wonderful that Myla saw such compassion and wanted to draw about and make a memoiram for Charlie. I think it’s sweet she wants everyone to know the story. What a wonderful Mom to put the picture in the window! 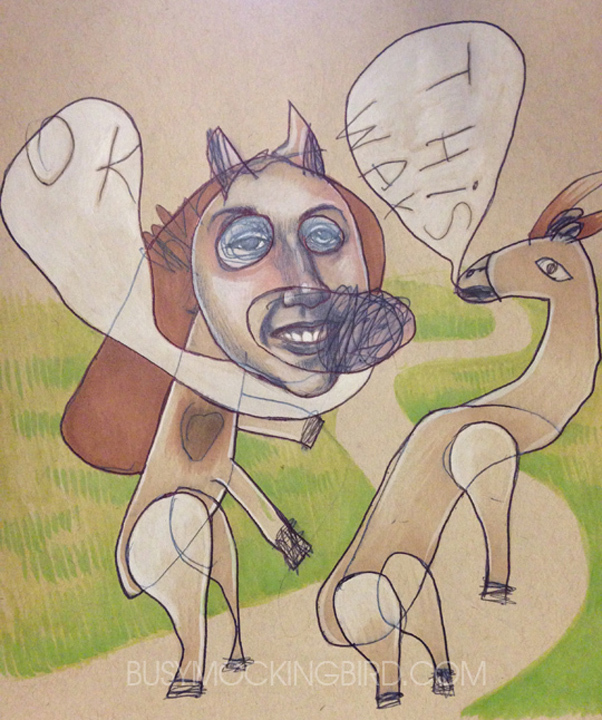 Enjoy following you and Myla – the quirkiness and great art is always inspiring and uplifting. That is so touching… I remember doing something similar when my Granny’s guide dog died – drew Topps for her. I was too young to understand then why it made her cry – until my own daughter drew a picture of our cat when it died; it’s a way of marking the effect the animals have on us. Well done for embracing it. Thank you for the video and the sharing of it too….such kindness. Oh Annette, thank you so much for commenting! We just love the story, and it really made an impression on our daughter. Your comment even encouraged us to watch the story of Charlie and Jack again. The picture of Charlie still hangs in our window, and their story touched my daughter’s heart. We wont forget them! I have to tell you when I was initially contacted by the production to see if we would have any stories befitting their topic, I told them we didn’t have anything unusual other than a deer that was helping a blind puppy I was working on and they came to do that story. While they were here, they asked about the horse and goat and I told that story, and it wound up being the sensation in the film. 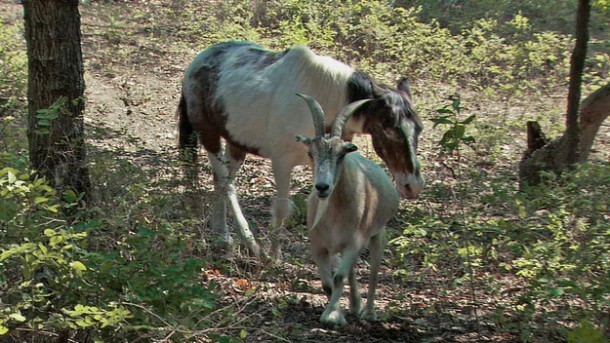 Its ironic how the partnership between the goat and horse was something that never surprised me because I have witnessed so many animals assisting disabled animals of other species. I didnt think they would be interested in a couple of old farm animals making life easier for one another. I was wrong. Viewers saw them the way I did. A beautiful thing. Just when you think you know producers, one comes along to change your opinion. They did a great job and told their stories without any embellishments. What a great archive. The story of charlie and jack makes me cry every time. Humans need to take a lesson and learn from these two,and others that are so loyal,trustworthy,love,and compassionate towards each other,that is what I call bbf .like my mom always told me you can only count your true friend on one hand …and as for the pictures they are awesome .